Your drivers might be the most important member of your team. Without them, your customers would never get what they ordered. There’s a lot of pressure on drivers to get orders right and get them there on time. If a driver gets lost on the road or drops off the wrong order because of a complicated and poor driver software, the unhappiness of your customers falls back on your company, not on the software that caused the mistake. So, why risk it? Why waste your time, your driver’s time, and your customer’s time with a driver routing software that isn’t cutting it? 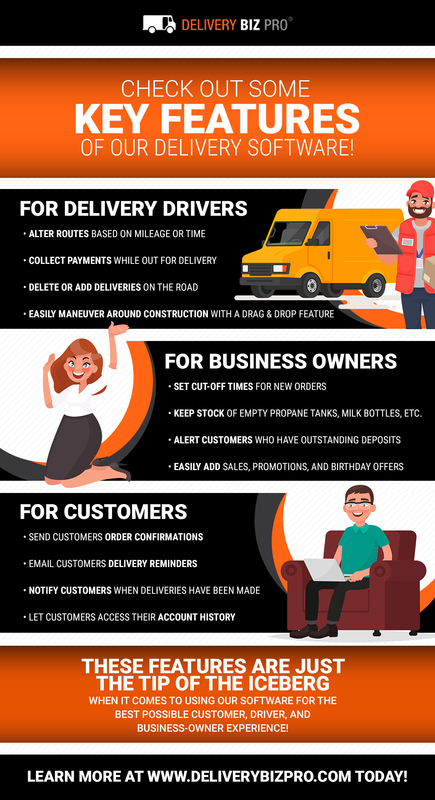 At Delivery Biz Pro, we want to empower your drivers. We want to give drivers the tools they need to make order changes on the road, get back on track if they need to make a detour, take payments, skip deliveries, text customers, collect signatures, and more, all with one convenient software that does the hard work for you. Keep reading to learn what these unsung heroes of the delivery world can do with our intuitive driver routing software. This is perhaps the most important feature of our routing software. It’s the bread and butter of any driver software: the ability to assign customers to routes in the easiest way possible. Whether you have multiple drivers on the road every day or one driver who delivers to different neighborhoods based on the day of the week, it’s easier than ever to assign drivers to a route. You can assign routes based on how your business model works. Do you allow customers to choose what day of the week they prefer their deliveries to come on? You can create routes based on the day of the week, so your driver hits all of the Monday houses on Monday, Wednesday houses on Wednesday, and so forth. You can also assign routes based on neighborhoods or cities. Using our delivery routing software, you can do something as easy as drawing circles on the interactive map which will automatically group customers in that region into their own route. One driver can cover the north side of the town while another covers the south. You can create as many routes as you need based on how many areas you are serving and how much space a driver can cover in a shift. You can assign routes based on what product is being delivered. Perhaps you have one driver delivering refrigerated goods and another dropping off non-refrigerated products. These drivers can be assigned to their routes, and customers who use both services can be added to multiple routes. Say you’re heading to the airport and you pull up directions on your smartphone. You will almost always be greeted with multiple route options. One route will save you 15 minutes, but you will drive more miles, while the other will save you some gas but take more time. Our driver software has the same features. You can set your system to assign stops based on distance or based on driving time and adjust this at any time while on the road with the touch of a button. Alternately, you can always manually adjust stops by using a ‘drag and drop’ function or by repositioning that stop in the numbered list. If your business model allows it, your customers can adjust their order on the day of the delivery up to a cutoff time that you indicate. When a customer logs into their account, they will be automatically notified if they have missed this cutoff time to avoid any confusion. This is perfect for businesses that deliver a single product, such as water jugs or propane tanks. If a customer remembers at the last minute that they have guests coming into town and will need an extra water jug this week, they can change their order online and your driver will be notified at that stop that they need to drop off an extra jug. Of course, if your team doesn’t know what to load onto the truck, then your delivery driver software might be lacking a crucial feature. Delivery Biz Pro allows you to generate load and drop sheets with the click of a button. These can be printed on paper or viewed electronically based on what is easier for your loading and driving team. Your load sheets can be organized alphabetically, by warehouse location, or by drop location for a first-one-in-last-one-out system. Our software also allows you to print labels with your company logo, the customer’s name and address, order numbers and product information, or whatever else you need to ensure that your driver and routing software is working for your business. Your drivers can use our touch-screen tablets to take charge of their route and deliveries. They can modify orders on the road, add new orders, and leave order notes if needed. They can also collect payments from customers with signatures, print invoices and receipts, skip deliveries based on last-minute changes, and mark deposit returns if your customers are sending back milk bottles, water jugs, or empty propane tanks. We know that was a lot of information! We’ve made a helpful infographic to help you process how many great benefits our routing software offers. Small businesses need reliable routing software that works for them, not against them. 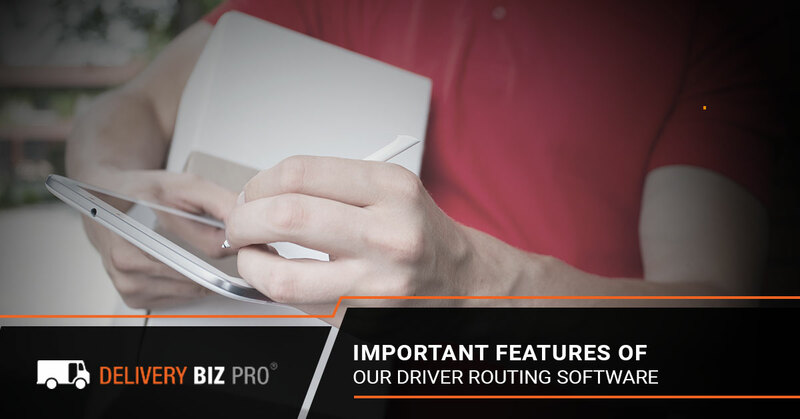 At Delivery Biz Pro, we have spent countless hours developing our driver routing software to fit the needs of multiple industries and business sizes and frequently update our product as new needs arise. If you think Delivery Biz Pro could help your business thrive, then apply for our delivery software today and we’ll schedule a time to chat and make sure DBP is right for your business. Keep in mind, in today’s blog we only discussed some of the driver routing features our software offers. You can view the rest of our features here, which cover everything from a customer-friendly website to data management and reporting to inventory tracking. Get in touch today to see if DBP is the right delivery software for you!